This rare image taken on July 19, 2013, by NASA's Cassini spacecraft has shows Saturn's rings and our planet Earth and its moon in the same frame. At the time, Cassini was 2013 from a distance of about 898.414 million miles (1.445858 billion kilometers) from Earth. It is only one footprint in a mosaic of 33 footprints covering the entire Saturn ring system (including Saturn itself) taken by Cassini's wide-angle camera. NASA has unveiled spectacular portraits of Earth and its moon from billions of miles away in images captured on Friday (July 19) and released today by the teams behind the agency's Cassini spacecraft at Saturn and its Messenger probe at Mercury. In the photos from Saturn, Earth appears as a tiny pinprick of light amid the haunting rings and glowing sphere of Saturn, which Cassini has been orbiting since 2004. Though the picture doesn't show it, more than 20,000 people on Earth waved at Saturn at just the time the photo was taken, as NASA had coordinated a plan to involve as many Earthlings as possible in the portrait. These images show views of Earth and the moon from NASA's Cassini (left) and MESSENGER spacecraft (right) from July 19, 2013. "We can't see individual continents or people in this portrait of Earth, but this pale blue dot is a succinct summary of who we were on July 19," Linda Spilker, Cassini project scientist at NASA's Jet Propulsion Laboratory in Pasadena, Calif., said in a statement. 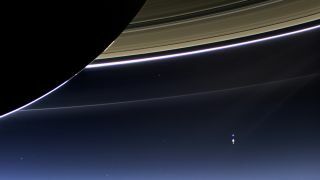 "Cassini's picture reminds us how tiny our home planet is in the vastness of space, and also testifies to the ingenuity of the citizens of this tiny planet to send a robotic spacecraft so far away from home to study Saturn and take a look-back photo of Earth." The cameras on NASA's Cassini spacecraft captured this rare look at Earth and its moon from Saturn orbit on July 19, 2013. The image has been magnified five times. Taken while performing a large wide-angle mosaic of the entire Saturn ring system, narrow-angle camera images were deliberately inserted into the sequence in order to image Earth and its moon. In Messenger's portrait, Earth and its moon are both easily visible, though each is just a point of light. The photo was taken from orbit around Mercury, 61 million miles (98 million kilometers) away. "That images of our planet have been acquired on a single day from two distant solar system outposts reminds us of this nation's stunning technical accomplishments in planetary exploration," Messenger principal investigator Sean Solomon of Columbia University's Lamont-Doherty Earth Observatory in Palisades, N.Y., said in a statement. "And because Mercury and Saturn are such different outcomes of planetary formation and evolution, these two images also highlight what is special about Earth. There's no place like home." These aren't the first noteworthy portraits of our home in the cosmos. On December 7, 1972, the crew of the Apollo 17 mission took the first full-view photo of Earth from space as the astronauts zoomed toward the moon. The photo, which became known as "The Blue Marble," is one of the most famous pictures ever shot. The "Pale Blue Dot," captured by NASA's Voyager 1 probe in 1990 from a record distance of 3.7 billion miles (6 billion kilometers) from Earth, is another classic. In its nine years at Saturn, Cassini imaged Earth several times. This occasion, however, was the first time Earth's residents had been notified to pose for their picture ahead of time, though, scientists said. The idea was embraced by many Earthlings, such as Sir Richard Branson, the billionaire founder of the private spaceflight firm Virgin Galactic. "Today we will all be photographed from a billion miles away: The Day The Earth Smiled," Branson wrote Friday on Twitter. "It thrills me to no end that people all over the world took a break from their normal activities to go outside and celebrate the interplanetary salute between robot and maker that these images represent," Carolyn Porco, Cassini imaging team lead at the Space Science Institute in Boulder, Colo., said in a statement. "The whole event underscores for me our 'coming of age' as planetary explorers." The Cassini mission launched in 1997 and arrived at the ringed planet in July 2004. It is expected to continue studying Saturn and its moons until 2017, when it will end its mission by crashing into Saturn's atmosphere. Messenger was launched in August 2004 and in March 2011 became the first spacecraft to orbit Mercury.